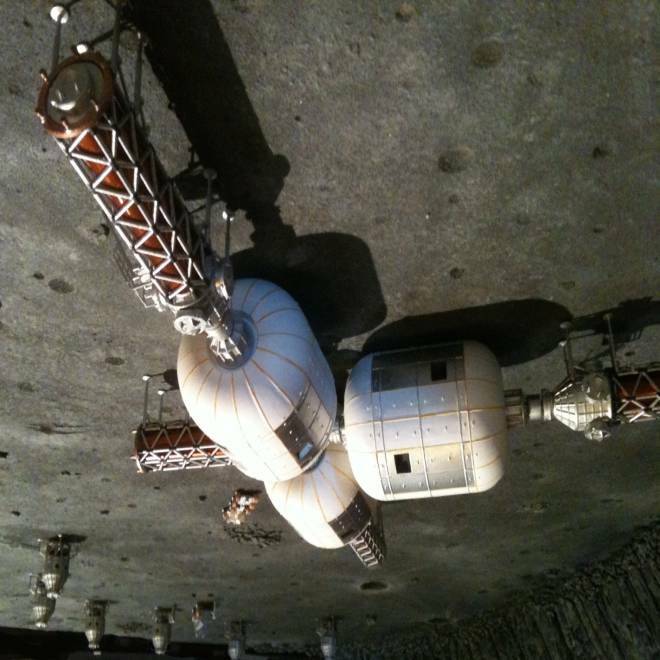 A mockup created by Bigelow Aerospace shows a moon base with inflatable modules. Bigelow Aerospace and NASA say they've agreed to look at ways for private ventures to contribute to human exploration missions, perhaps including construction of a moon base. But the space agency emphasized that it's keeping its own focus squarely on corraling an asteroid and then going to Mars. "As part of our broader commercial space strategy, NASA signed a Space Act Agreement with Bigelow Aerospace to foster ideas about how the private sector can contribute to future human missions," David Weaver, the space agency's associate administrator for communications, said in a statement emailed to NBC News. "This will provide important information on possible ways to expand our exploration capabilities in partnership with the private sector," Weaver said. "The agency is intensely focused on a bold mission to identify, relocate and explore an asteroid with American astronauts by 2025 — all as we prepare for an even more ambitious human mission to Mars in the 2030s. NASA has no plans for a human mission to the moon." The moon, however, ranks high among the targets that Bigelow Aerospace has in mind. The Nevada-based company has been working on moonbase concepts for years. During a recent interview on the "Coast to Coast AM" radio show, billionaire founder Robert Bigelow said the potential objectives for private-sector space efforts include a lunar base as well as space stations or refueling depots placed at gravitational balance points in the Earth-moon system. "We're making no bones about it, that's what we're out to try to accomplish," Bigelow said. Mike Gold, a Washington-based spokesman for Bigelow Aerospace, explained that his company wanted to help "commercial space achieve escape velocity from LEO," or low Earth orbit. Gold said the NASA-Bigelow agreement would build on the work done by SpaceX, Orbital Sciences Corp. and other companies to build new spaceships for trips to the International Space Station. "What this is doing is projecting that forward, and exploring what commercial companies can do both to lower the cost of beyond-LEO operations, and to create enhanced capabilities," he said. The agreement with NASA calls upon Bigelow Aerospace to lay out the potential contributions to exploration beyond Earth orbit. "First, we'll be identifying what the companies and technologies are that could contribute, and then we'll be examining what some of those specific mission scenarios might be," Gold said. During the "Coast to Coast AM" interview, Robert Bigelow said the first phase of the study would take 100 days, and the second phase would take 120 days. No money is changing hands under the agreement, which Gold said was signed in late March. The recommendations coming from the study could include potential opportunities for NASA to buy or lease facilities from private space ventures. Earlier this month, NASA Administrator Charles Bolden said that the space agency would not "take the lead on a human lunar mission." However, Bolden did not rule out the possibility that NASA might play a role in missions led by other countries or private ventures. Bigelow Aerospace made its mark in low Earth orbit in 2006 and 2007 when it sent two inflatable space modules into orbit aboard Russian launch vehicles. Those space station prototypes, Genesis 1 and Genesis 2, are still in orbit. In January, Bigelow Aerospace and NASA struck a deal to deliver a larger inflatable module, known as the Bigelow Expandable Activity Module or BEAM, to the International Space Station in 2015 on a SpaceX resupply flight. Eventually, Bigelow plans to put a separate commercial space station in orbit, assembled from two even larger inflatable modules. Each of these BA330 modules would have a habitable volume of 330 cubic meters, and putting two of them together would create an "Alpha Station" for a maximum crew of 12. Gold said that the company was continuing to discuss the concept with international space agencies and corporations, but he emphasized that the venture depended on having regular commercial flights to orbit. A key development would be the production of commercial spaceships capable of transporting astronauts to and from the International Space Station, Gold said. NASA has said such spaceships should be flying by 2017. "The BA330 will be ready prior to commercial crew, so that’s roughly the timeframe were looking at," Gold said, "and we're ready to take on customers now." Tip o' the Log to New Space Journal and Space News.